Royale Eco Cleaning Ltd, offer professional area rug cleaning services to bring your rugs back to its new look. 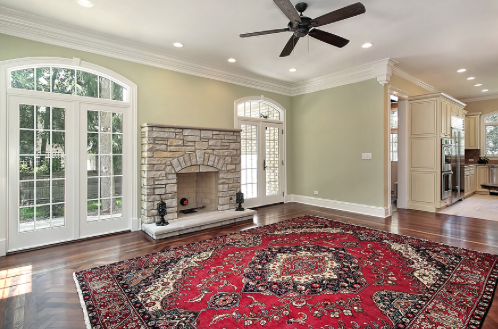 Our trained professional team will thoroughly handle every piece of your rug. We set the highest green standards in rug cleaning. That is why we use only the best cleaning formulas that contain only natural biodegradable ingredients. Professional approach at every stage of rug cleaning allows us to provide absolutely superior organic cleaning services to our clients. Same Place Cleaning, or on our premises what is most conveniant to our client. Royale Eco Cleaning Ltd, provides same place service. We do not want to deprive you of your beloved rug for a long time. That is why we do the cleaning of your rug right away at your place. THE British penchant for fitted carpets could be killing us. According to a report published today, carpets act like toxic sponges, sucking up dangerous amounts of poisons and pollutants dragged into the home by pets and on shoes. John Roberts, an environmental engineer known as Dr Dust for his obsession with household hygiene, said that a typical carpet contained such high levels of toxic chemicals that it would trigger an environmental clean-up if found outside. His findings suggested that dirty carpets could be one of the major causes of the rise in children's asthma, allergies and cancer. It could mean that living in a wooden-floored loft is better for your health. Ninety per cent of British homes were carpeted, more than any other country. Mr Roberts said a laboratory test of a sample of carpet dust from an average home revealed alarmingly high levels of pesticides, cancer-causing polycyclic aromatic hydrocarbons, heavy metals such as lead, cadmium and mercury, and polychlorinated biphenols (PCBs). PCBs were banned in the 1970s but are still found in electrical equipment, wall coverings, paints and plastics. They have been proved to cause cancer and reproductive problems such as miscarriages and still births in animals, as well as severe skin rashes, liver damage, breathing disorders and thyroid gland illnesses. Most of the toxins were brought into the house on shoe soles or the paws of pets. Others were produced during cooking or were the residues of insecticides, deodorisers, cleaning products and other household sprays used in the home. Pet hair, the remains of dry-cleaning chemicals left on clothes, noxious chemicals in cigarette smoke, dust mites and mould added to the mix, resulting in exposure to toxic pollutants being up to 50 times higher in the home than outdoors. To make matters worse, long-banned pesticides such as DDT persisted for years indoors because they were sheltered from sun, rain and other forces that quickly degraded them outdoors, said Robert Lewis, head of indoor air research at the United States Environmental Protection Agency. Even relatively low levels of the poisons in dust could irritate their lungs, damage their developing nervous systems, retard their growth and hearing, or lead to cancer. Researchers estimated that every day the average infant under the age of two in urban America ingested 110 nanograms of benzopyrene, equivalent to smoking three cigarettes a day. This chemical, the most toxic of all polycyclic aromatic hydrocarbons, was normally found in tobacco smoke and cooking fumes.